Style. – Life Is Such A Sweet Insanity. 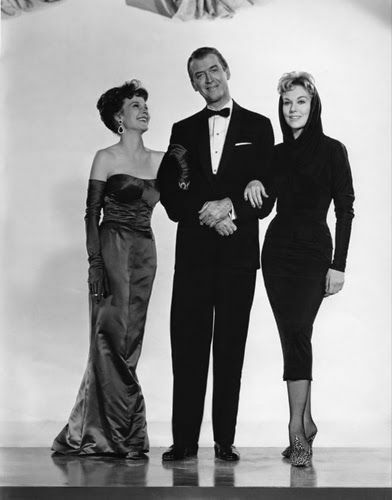 BELL, BOOK AND CANDLE 1958 DIRECTED BY RICHARD QUINE Janice Rule, James Stewart and Kim Novak. Per our annual holiday tradition, Earl and I watched “Bell, Book, and Candle” last night. The 1958 movie stars Kim Novak and Jimmy Stewart. Kim plays Gillian Holroyd, a witch living in Greenwich Village. Jimmy is her human love interest. It’s a very bewitching movie and probably my favorite movie of all time. I love watching movies from the mid 20th Century. Not only is the architecture and decor absolutely gorgeous, folks from that era knew how to dress for the occasion. In the movie, Shepherd and Merle meet up with Gillian at the Zodiac Club, an underground club. Live music is playing, people are drinking martinis and the like and Jimmy Stewart’s Shep is wearing a tux for the occasion. Janice Rule’s Merle is wearing a beautiful gown. Their style is impeccable. People knew how to look their best. This morning during my walk I couldn’t help but notice the number of people getting on the train in sweatpants. I wondered if they were headed to work dressed that way or off to the gym. My workplace is now allowing shorts to be worn year ’round. I would never think to wear shorts to the office. I used to be a t-shirt and jeans kind of guy but as I’ve grown older I’ve felt the need to dress nicer. I’d love to wear a tux again. Maybe the next time Earl and I go out for a swanky date night I’ll really dress up for the occasion. I always feel my best when I’m dressed to be bewitching.